Bricklin Prototype's 1 and 2 Photos. All photos of the Prototype 2 in Red are courtesy of Michael V. Mitchell. 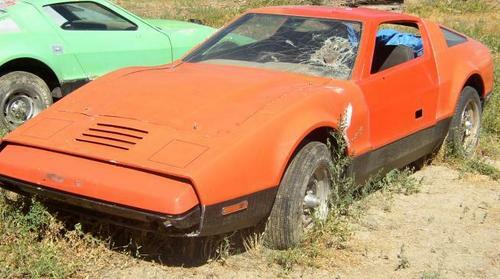 Stills of Prototype 2 in Ochre are courtesy of Bricklin International Chairman Emeritus: Jerry Putnam. 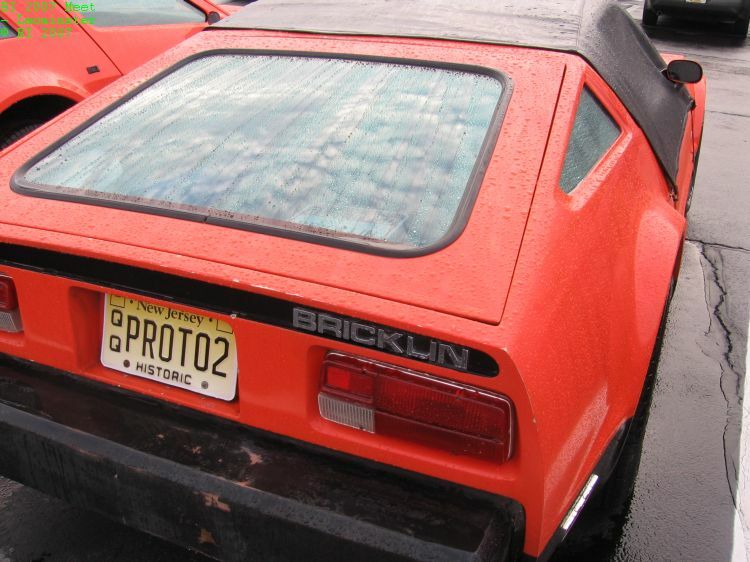 Photos of Bricklin Prototype 1 are courtesy of Brian Cochran. Back in the late 1970's as I recall, on a telephone conversation with Bricklin International founder, the late Jack Suita, he indicated to me that there were 7 prototype Bricklins made, and 7 pilot Bricklins made, in addition to the first prototype: The Gray Ghost. 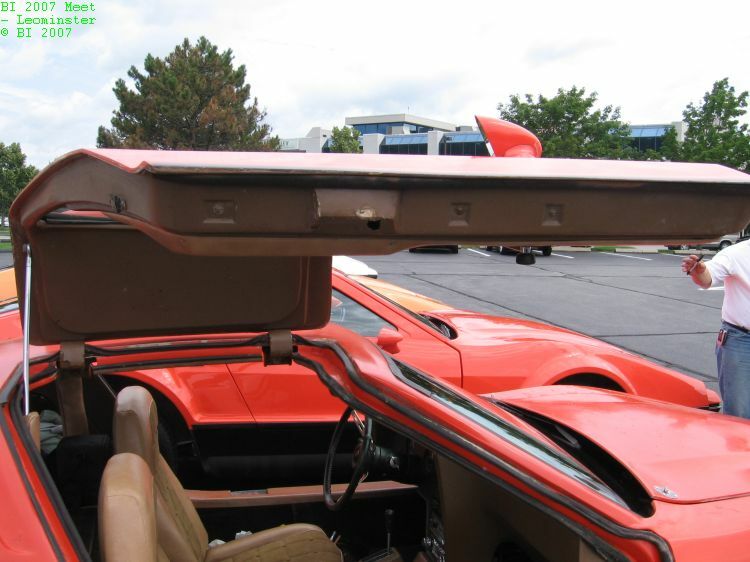 At the time the Bricklin debuted, and was new, it was in the major car magazines of the time. I have been informed that the prototype in the magazines at the time, that bore the Michigan license plate number 22M-086 was Bricklin Prototype 3. 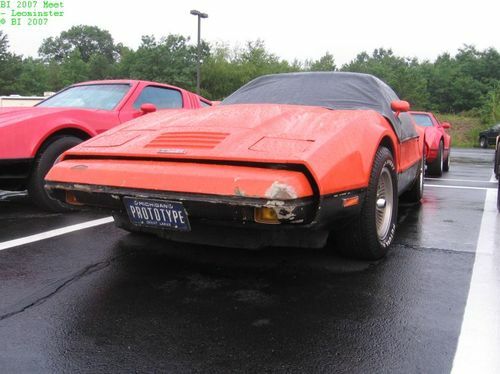 Both sets of photos on this page are of Bricklin Prototype 2. The photos of the car in red are circa 2007. 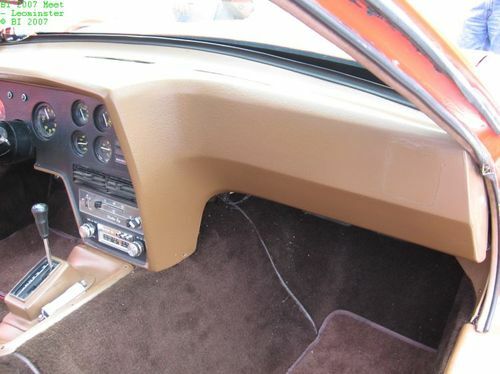 The photos of the car in ochre are circa 1973. The photos show the same car at a different stage of development, age, and time. Reportedly the car was painted red after the ford engine was put in it for testing. 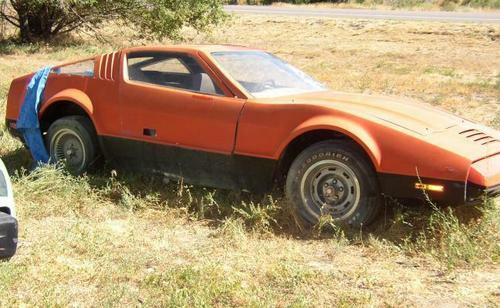 I think it very likely that Prototype 2 was the Bricklin pictured on the cover of the July 1974 issue of Car and Driver Magazine. 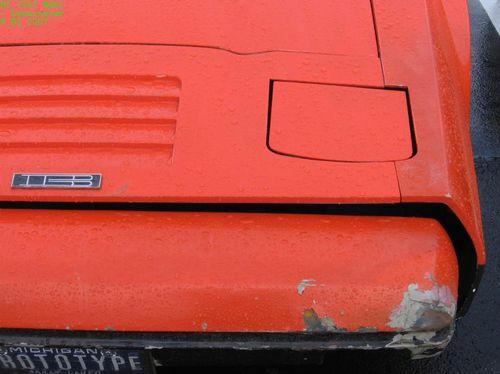 The Bricklin Pictured in the September 1975 issue of Mechanix Illustrated, that bore the Michigan Plate number: 21M-187, was Bricklin SV-1, VIN 1030. Per a recent email from Jerry Putnam, he indicated to me that prototype number 5 was used in front and rear impact tests. According to Jerry, the crash tests on prototype 5 were done May 30 - 31, 1974. 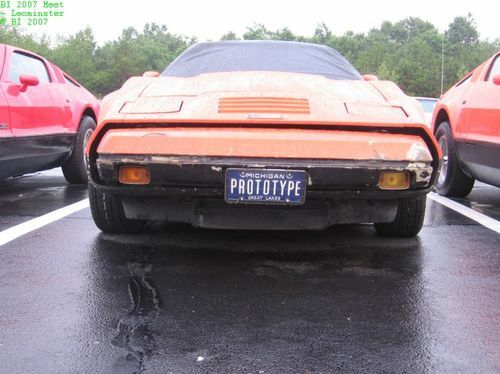 Prototype 8 was also used in crash tests. Although Prototype 5 may have been destroyed after testing, who knows... it might be in the corner of some salvage yard, garage, or barn, somewhere in the United States or Canada, awating re-discovery. If you have any information or photos of Prototype or Pilot Bricklins, and are willing to share them, please contact me. Many thanks to Michael V Mitchell, Jerry Putnam, and Richard Ractliffe, for their help and assistance on this page. - Senior Editor / Webmaster. "Gray Ghost" - Color - silver. Chrysler engine and transmission. Prototype 1 - Color: Red. 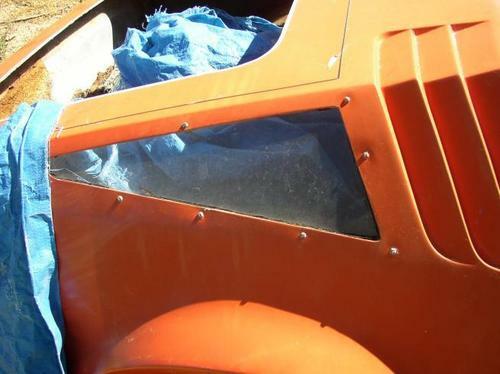 Fiberglass body / shell - no interior trim. 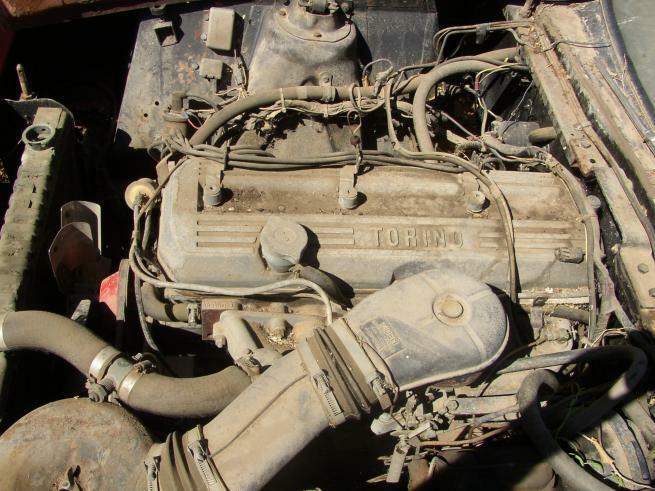 Engines: AMC 360, later AMC 6 cylinder. 4 speed. License Plate: 22M-210 ( 1973 ). Prototype 2 - Color: Ochre, later Red. Fiberglass body. 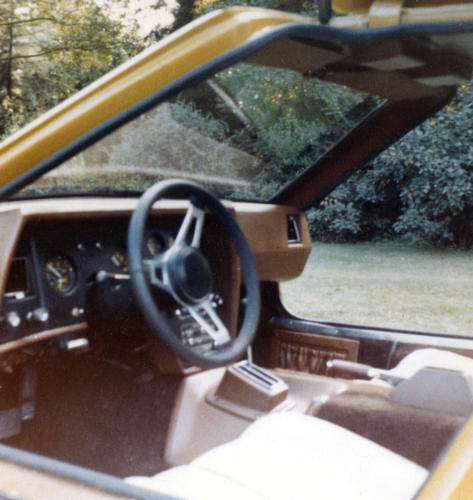 1st prototype built with complete interior. 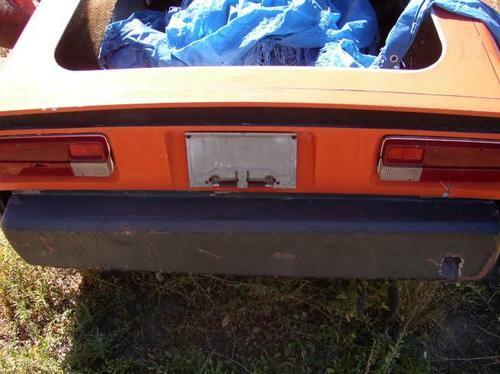 License plates: 22M-211 ( 1973 ), 22M-092 ( 1974 ). AMC 360 engine. Later Ford 351 installed for testing / certification. Automatic transmission. Prototype 3 - Color: Red. Acrylic body. AMC 360 engine, automatic transmission. License used: 22M-086. Used for the exterior design for the Chairman Car. Prototype 4 - Acrylic White body. 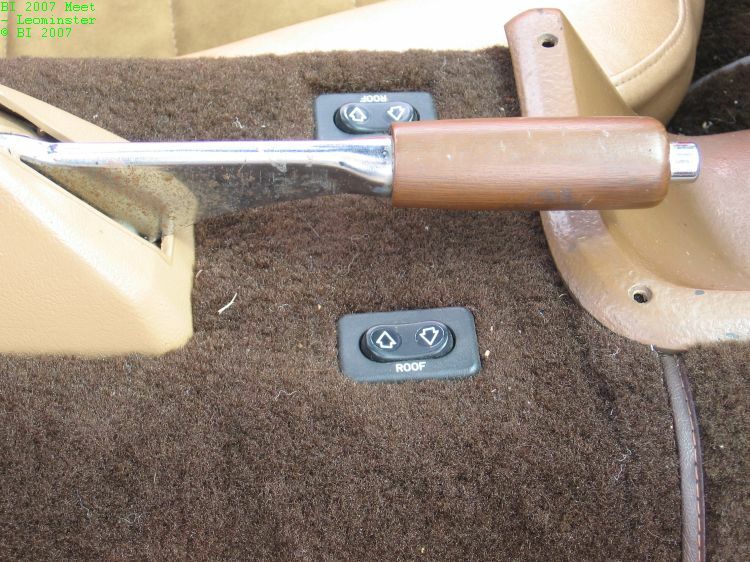 4 speed transmission. License used: 22M-085. Prototype 5 - Acrylic White Body. Automatic transmission. Used for crash testing, Phoenix, Arizona. Prototype 6 - Not a completed car: chassis, frame, and bird cage. Prototype 7 - Suntan acrylic body. Automatic transmission. Prototype 8 - Acrylic Orange body. Used for front crash / impact test. Reported extant 2010 and now white. The " Gray Ghost " was built on the west coast. Prototypes 1 through 7 were built by: Advanced Vehicles Concepts ( AVC ), in Michigan. Prototype 8 was built by: General Vehicle Incorporated ( GVI ). Suggested Reading: The Brickline, Volume 5, Number 6, 1980. Front View.. note circa early - mid 1970's Michigan License Plate. Also note lower front spoiler. 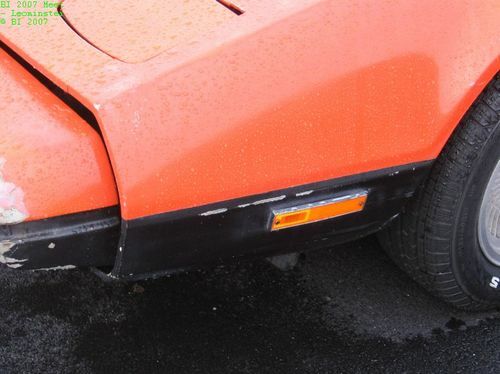 The production lower front spoiler was reportedly factory installed on production Bricklins from VIN 0001 - 1964. 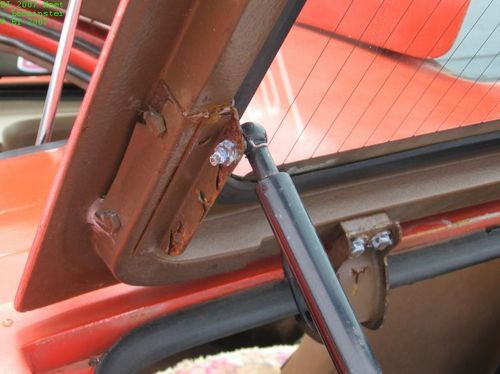 Left hand headlight door. Note that on this prototype the door extends into the left hand fender, and the forward part of the headlight door is rounded. 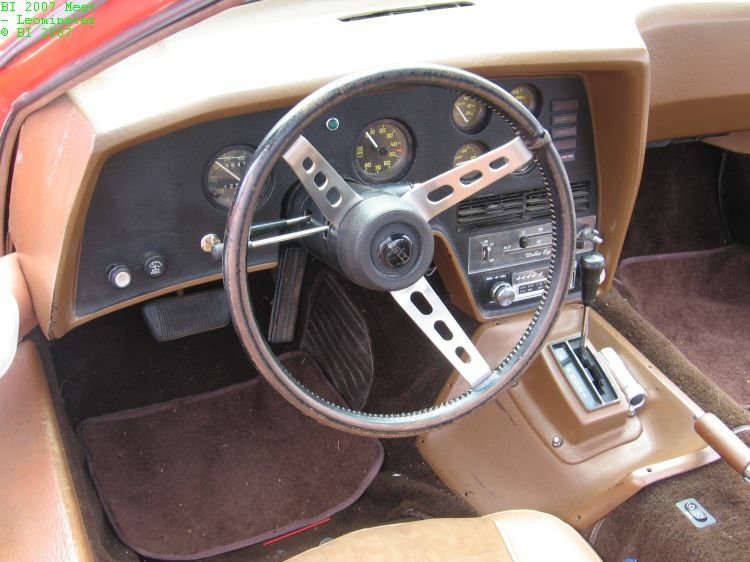 Prototype dash and instrument cluster, very diifferent from the production Bricklin. 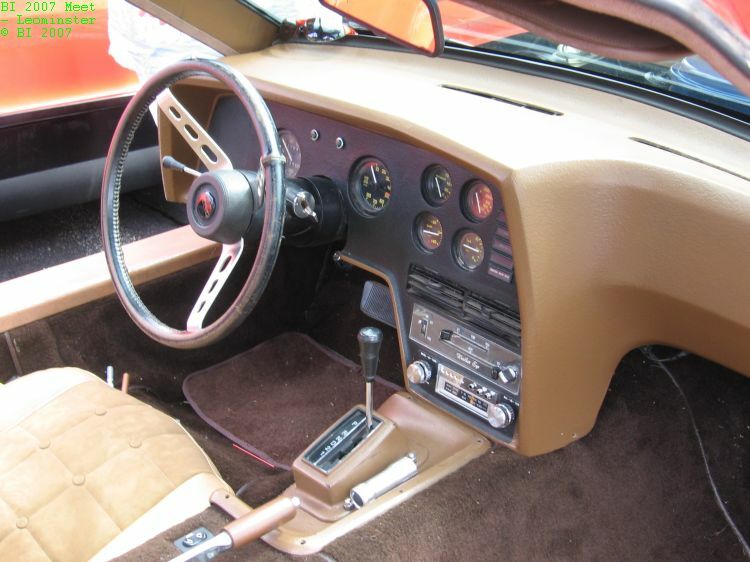 Note the gearshift bezel appears to be the same as the production Bricklin, except it is tan in color. Also note lack of air conditioning vents. Prototype dash passenger side, different from the production Bricklins, and no air conditioning vents. Prototype forward left hand fender, bumper, headlight door. 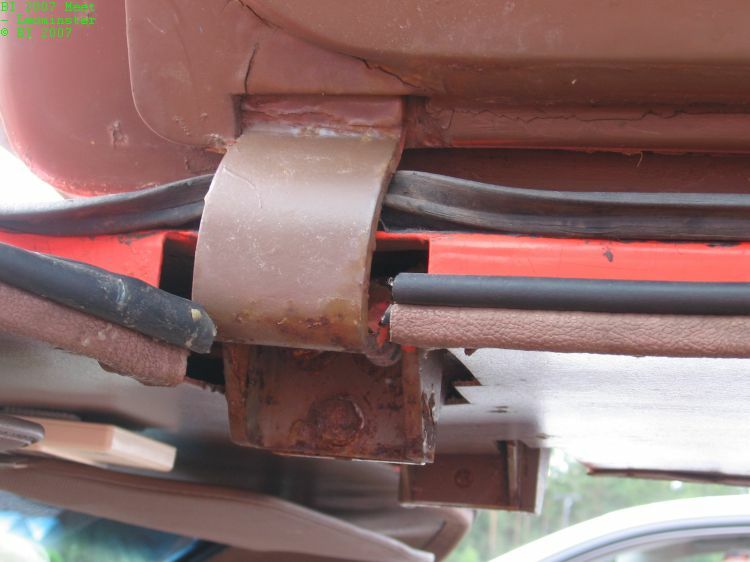 Prototype rear hatch cylinder assist, and mounting - bracket. Prototype door hinge and attachment. 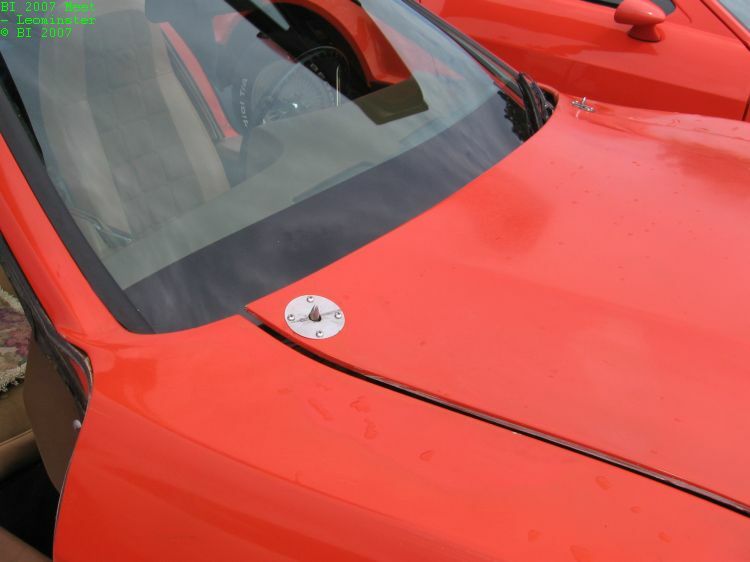 Prototype hood, and note that the A pillar flows directly into the right front fender. Also note single windshield wiper - reportedly built that way. Prototype central view of the dash and instrumnet area - interior. 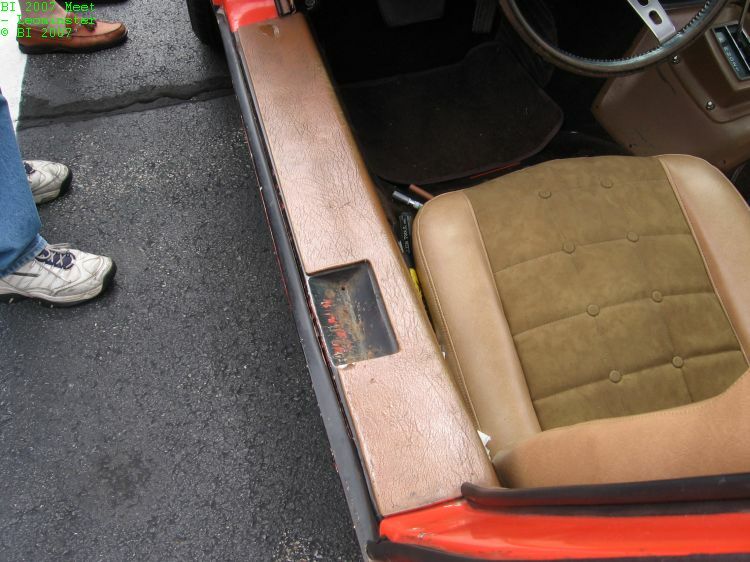 Prototype door sill and drivers seat. 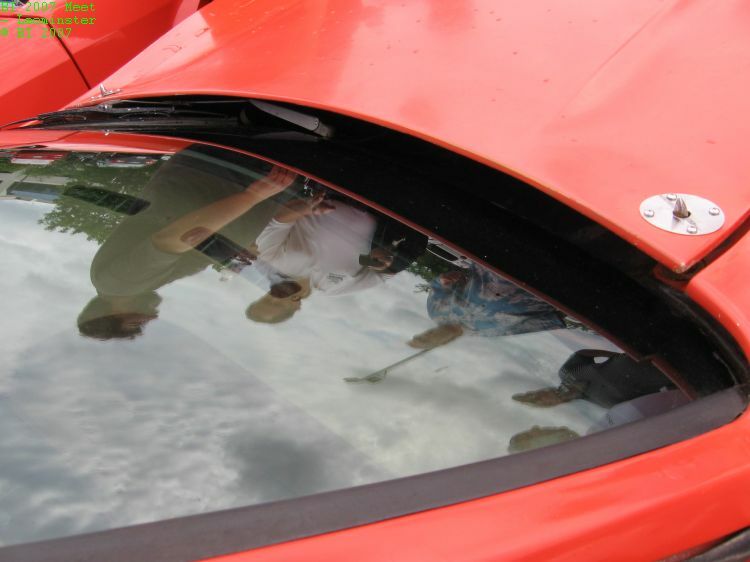 Prototype windshield, hood, A pillar, and single windshield wiper. Safety Ochre Prototype side view, doors up. Wheels appear to be 1970's era mag wheels. 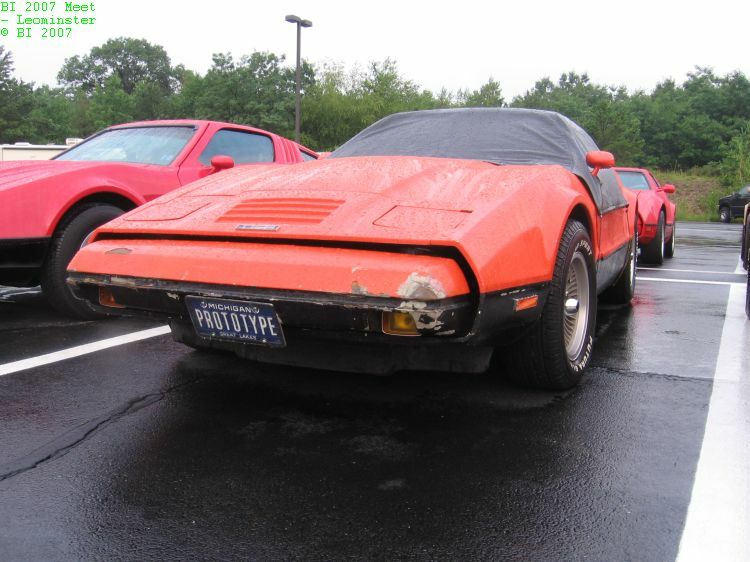 Safety Ochre Prototype rear view, no BRICKLIN nameplate, Michigan License: 22M-211. 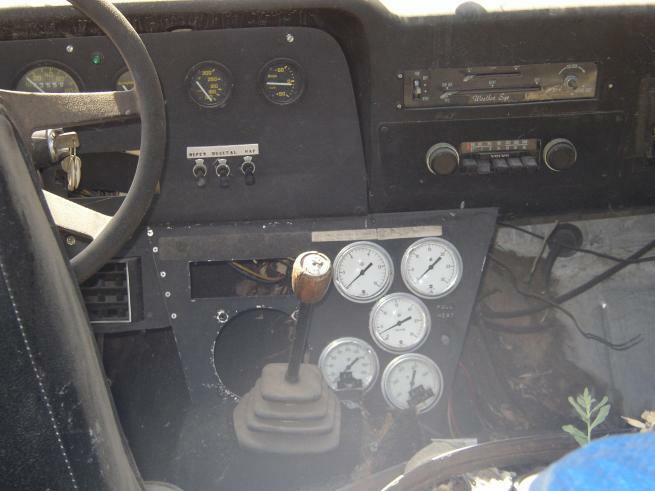 Safety Ochre Prototype dash - interior - instuments - steering wheel. 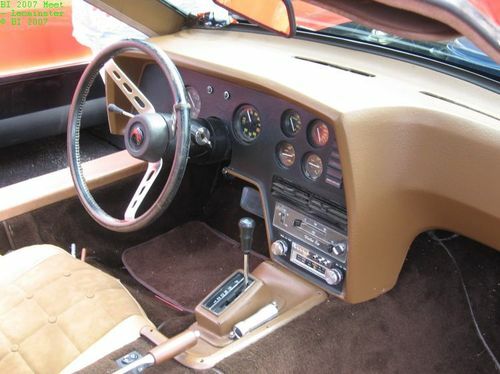 Safety Ochre prototype seats, circa 1973. Headlights up, appear more rectangular than in production Bricklins. Rear hatch view of the dash - interior. Red Prototype 1, alongside Safety Green VIN 1182 - sporting a prototype style right rear wheel. Prototype 1 right side view. Prototype 1 instruments - interior.